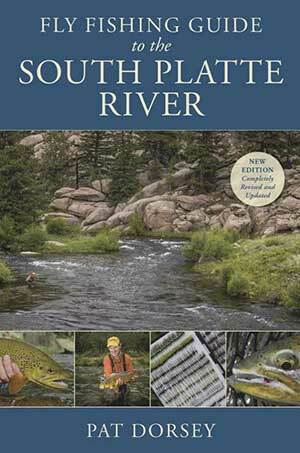 The South Platte River begins in Colorado high atop the frozen Continental Divide, home to a chain of rugged 13,000-foot, snowcapped peaks. This region comprises lush valleys, meandering meadow streams, and rose-colored, boulder-filled canyons. 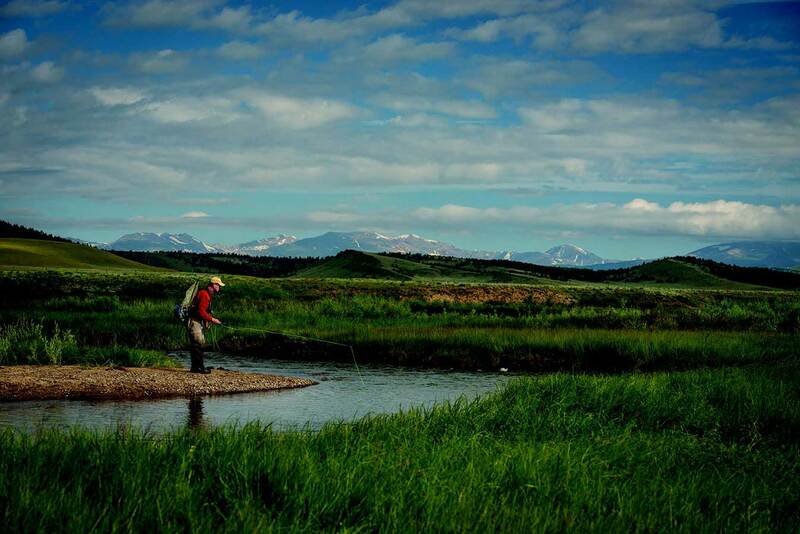 For generations it has been a recreation mecca and a fly fisher’s paradise in its purest form. The South Platte drainage has a rich history, intermingling mining, cattle grazing, commercial fishing, ranching, railroading, and tourism. Our tour of the South Platte basin begins on the southeast slope of 11,541-foot Hoosier Pass. The Middle Fork, as it is referred to, originates southeast of Breckenridge and meanders through the neighboring communities of Alma and Fairplay before joining forces with the fabled South Fork, which begins on the eastern side of 11,900-foot Weston Pass. Like the Middle Fork, it too starts as snowmelt, twisting and turning its way through rich ranchland before entering Antero Reservoir. From the base of Antero Reservoir, the South Fork carves its way toward the small community of Hartsel and finally merges with the Middle Fork just above Spinney Mountain Reservoir. From the confluence downstream, the river is known by fly-fishing aficionados as the South Fork of the South Platte, which eventually rendezvouses with the North Platte River, in North Platte, Nebraska. Throughout the river’s entirety, the South Platte creates a series of reservoirs (Antero, Spinney Mountain, Eleven Mile, Cheesman, Strontia Springs, and Chatfield) that provide major metropolitan water storage systems for Denver Water and the city of Aurora. The byproducts of these storage facilities are world-class tailwaters that provide anglers with year-round fishing opportunities. The South Platte River is the jugular vein of the central Rocky Mountains. It supports three million people and four million livestock, not to mention billions of pounds of world-class hay and other assorted grains. Additionally, more than three-quarters of a million people have settled in the nearby urban areas, demanding their share of the resource for day-to-day living. As the population continues to grow, water becomes a rare yet essential commodity. Only one of every four gallons that originates in the South Platte corridor ever reaches the river’s end. Cities, farmers, and industry consume the remaining water; in many cases it is reused at least three times. Over the years the South Platte watershed has experienced its fair share of ups and downs, but somehow against all odds, trout populations still prevail. In the 1980s Denver Water instigated a huge environmental controversy, Two Forks Dam, which proposed to submerge 20-plus miles of prime trout habitat to build another stillwater impoundment. As planned, the 615-foot-high project with a price tag of nearly $500 million was designed to create an additional reservoir to meet the demands of 400,000 new Denver metropolitan residents. The new 1,700-foot-wide dam and reservoir would have been a mediocre fishery at best because of the steep, serrated granite shorelines and lack of shallow mossy feeding areas that are conducive for good trout populations in stillwater fisheries. Foot access would have been extremely difficult if not completely impossible in several areas because of the terrain. Thank goodness the environmental community came together and formed an incredible network opposing the proposed Two Forks Reservoir. Trout Unlimited argued that it would decimate one of the greatest wild trout populations in the world, and the National Audubon Society and National Wildlife Federation argued it would have a detrimental effect on river-dependent species. More than 10,000 citizens wrote letters and appeared at numerous public hearings opposing the Two Forks Dam. The politicians, however, didn’t budge on this issue. From their perspective, water storage was the only priority and outdoor recreation would take a subordinate role in the big picture. The only alternative was more conservation and limiting the growth of the Denver metropolitan area. The saving grace was when George H. W. Bush was elected to office in 1988. Environmental leaders persuaded Bush and his Environmental Protection Agency chief, William Reilly, to veto the Two Forks project as a violation of the Clean Water Act, and in 1989 Reilly did just that. The headlines in the Denver Post and the Rocky Mountain News were memorable: “EPA Vetoes Two Forks.” It was perceived as a victory: Two Forks Dam was dead, at least for now. The decision shocked everyone, and many politicians appealed to Bush’s former campaign manager, Lee Atwater, to get the veto overturned. There were powerful supporters of the veto, however. Former president Gerald Ford—a part-time Colorado resident—also recommended that the Bush administration kill Two Forks for good. So, for the time being, Two Forks Dam was dead. Politicians still continue to lobby for a smaller version of the dam, however, and only time will reveal the outcome. Next, whirling disease surfaced in the early 1990s and decimated wild rainbow populations; then there were the high-water years of 1995 and 1999, followed by a six-year drought, the Schoonover and Hayman Fires, and finally the straw that broke the camel’s back—the flash flooding of 2002, 2003, and 2004 that clogged Cheesman Canyon and Deckers with insect-choking sediments and decomposed granite, causing a substantial decline in trout populations. In 2015 the South Platte experienced record-high flows in many sections, with river levels exceeding 1,000 cubic feet per second (cfs) in South Park (Charlie Meyers State Wildlife Area), 2,300 cfs below Cheesman Reservoir, and nearly 3,000 cfs in the Deckers area. The river’s substrate changed dramatically after the high water of 2015. On July 6, 2018, a flash flood devastated the middle part of Cheesman Canyon; 3.8 inches of rain fell in one afternoon. The worst damage occurred between Hell’s Half Acre and the Meat Hole, where numerous washouts deposited several tons of decomposed granite into the river from the Hayman Fire burn scar. It’s hard to imagine what would happen if the South Platte River were managed as true trout habitat instead of a water resource. Flows fluctuate daily, creating undue stress for trout. Denver Water is faced with a juggling act as it tries to balance the needs of anglers and those of senior water-rights holders. In the aftermath, it appears as though the trout take the brunt of the punishment. Lawyers and politicians have literally made careers out of litigating who gets water and when. Of all the trout fisheries in America within an hour’s drive of a major metropolitan area, the South Platte River is clearly one of the best. It has become a river shrine to thousands of anglers on an annual basis and for good reason. The South Platte rainbow is one of the prettiest fish in the world. South Platte regulars believe that the South Platte rainbow is a subspecies of their own. They are wild, super-selective, and extremely difficult to fool! Not only is the South Platte known for its wily trout, but it’s also where some of the greatest trout flies of all time were developed—specifically, near Deckers during the early 1970s. Among the most popular are the South Platte Brassie, invented by the late Gene Lynch; the Buckskin and Miracle Nymph, created by Ed Marsh; and the RS2, the most popular South Platte fly of all time, developed by Rim Chung. More than 30 years later, these flies still fill anglers’ fly boxes and are routinely plucked from trout’s jaws along the entire South Platte waterway. More recently, in the 1990s, the Black Beauty, Top Secret Midge, Mercury Midge, Rojo Midge, and Manhattan Midge were developed here, and they also gained nationwide notoriety. It’s truly amazing how the use of these effective flies has spread to other tailwaters throughout the country.